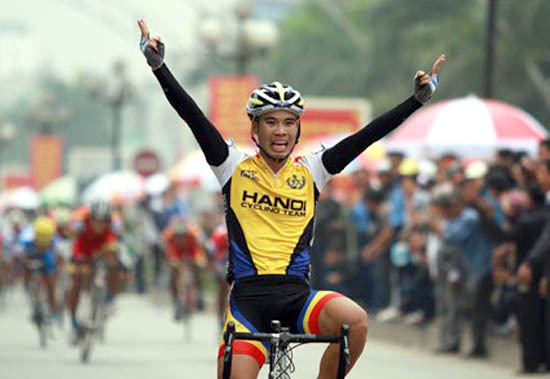 HCM CITY (VNS) — Le Anh Dung won the 12th stage of the 27th HCM City Television Cycling Cup and Nguyen Minh Viet won yesterday's yellow jersey. Dung clocked a top speed of 38.917 kmph during the 101km stage from Quy Nhon to Tuy Hoa City, completing the stage in two hours, 35 minutes and 43 seconds. Phan Tuan Vu of VTV Can Tho and Ho Hoang Son of Thanh Son Hoa Nong finished second and third, respectively. Viet of VTV, Binh Duong defended his yellow jersey for best overall time with at total 31:06.13 after 12 stages.